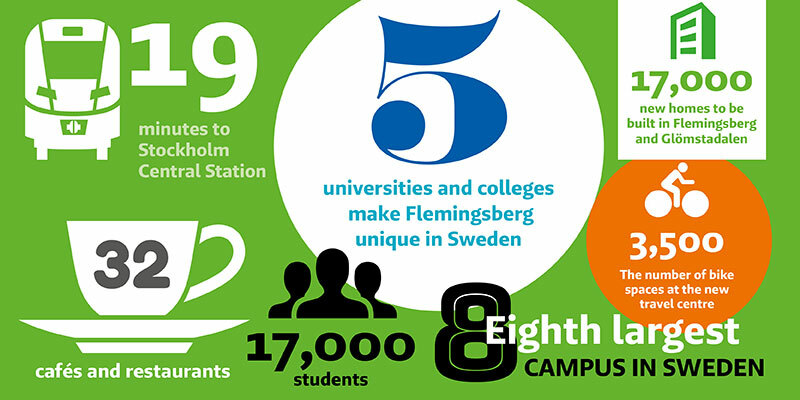 Campus Flemingsberg is the eighth largest campus in Sweden with 17,000 students. With its five colleges and universities within walking distance of each other, Campus Flemingsberg is unique. On campus you are met by a mix of studenter and scientists from Karolinska Institutet, The Royal Institute of Technology in Stockholm (KTH), Södertörn University, The Swedish Red Cross University College and University College of Music Education in Stockholm (SMI). A campus environment with close to 17,000 students, where Karolinska University Hospital’s healthcare provision and research are a natural feature of life in Flemingsberg. The campus is home to five colleges: Karolinska Institutet (KI), the Royal Institute of Technology in Stockholm (KTH), Södertörn University (SH), the Swedish Red Cross University College, and the University College of Music in Stockholm. This is also where two research facilities, Neo and Technology and Health, are taking shape. A powerful investment in more student housing, directly adjacent to the campus area. Nobelus is a new city block mixing accommodation for both students and scientists. Along Hälsovägen more student housing is being built close by Flemingsbergsparken. Visättra ängar och Björnkulla has both newly built and older accommodation. Read more at Stockholms Studentbostäder. The Flemingsberg Union of Students includes five student bodies that pool their strengths to work for a vibrant student life – around the clock. Here you’ll find several initiatives to support great ideas. Flemingsberg Science has launched the Innovation Café on its new Novum premises. The Innovation Café will be run with a raft of partners such as Drivhuset and a number of patent offices and business advisors. Open Lab is managed by, among others, SH, KTH, and KI. Flemingsberg Science offers development and advisory opportunities to those with a passion to succeed. Bandy, hockey, skate toboggan, foot­ball, exercise and ski-tracks, a boule­ hall, fris­bee­ golf and an outdoor gym make Visättra Sports Center one of greater Stock­holm’s largest sports centres. Visättra­hallen seats up to 2,000 visitors, and is a flexible venue that also offers conference facilities. In winter, there are activities on ice and snow, and in summer there’s space for in­lines and other activities on the ice rink. Flemingsbergsskogen is one of Stockholm municipality’s largest track-free wooded areas: a nature reserve that stretches from Flemingsbergsviken to Gladökvarn, and even reaches Botkyrka municipality.